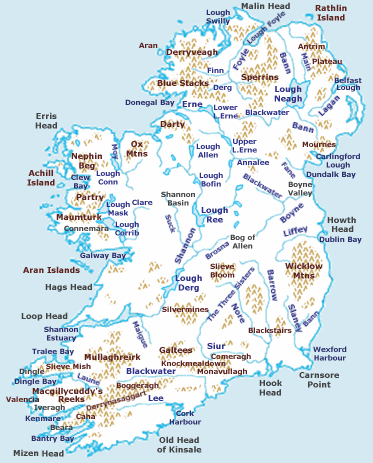 Shown here are all the major rivers and tributaries of Ireland with their lengths (in kilometres and miles). Starting with the Northern Ireland rivers, and going in a clockwise direction, the rivers (and tributaries) are listed in regard to their entry into the different seas: the Irish Sea, the Celtic Sea and the Atlantic Ocean. Also shown are two tables. Table 1 shows the longest rivers in Ireland with their lengths (in kilometres and miles), the counties they flow through, and their catchment areas (in square kilometres). Table 2 shows the largest rivers in Ireland (by mean flow) in cubic metres per second. The longest river in Ireland is the River Shannon, at 360.5 kilometres (224.0 mi). The river develops into three lakes along its course, Lough Allen, Lough Ree and Lough Derg. Of these, Lough Derg is the largest. The Shannon enters the Atlantic Ocean at the Shannon Estuary. Other major rivers include the River Liffey, River Lee, River Swilly, River Foyle, River Lagan, River Erne, River Blackwater, River Nore, River Suir, River Barrow (The Three Sisters), River Bann, River Slaney, River Boyne, River Moy and River Corrib. ^ a b c Robert A. Williams (27 May 1872). "Notes on river basins" – via Internet Archive. ^ "Biology and Management of European Eel p.29" (PDF). wordpress.com. ^ a b Robert A. Williams (27 May 1872). "Notes on river basins" – via Internet Archive. ^ a b "Secondary Schools Teacher Resources - Ordnance Survey Ireland". osi.ie. ^ "- National River Flow Archive". ceh.ac.uk. ^ "SMILE - Sustainable Mariculture in northern Irish Lough Ecosystems". www.ecowin.org. ^ "Department of Housing, Planning and Local Government". Department of Housing, Planning and Local Government. ^ "Search for gauging stations". ceh.ac.uk. 5 October 2015. ^ Robert A. Williams (27 May 1872). "Notes on river basins" – via Internet Archive.